"So, I must be thinking Christmas for more than just the blog hop that's coming up. 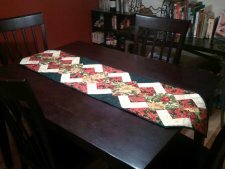 My husband's aunt Sue's birthday was today (she also happens to be my boss) so I put together a table runner for her. I used some fabric from the stash that my mom brought me, she gave me a fat quarter bundle from Nancy's Notions in some great Christmas prints. I threw in some dark green from the stash that Aunt Sue gave me and I had the perfect amount of fabric for this table runner. 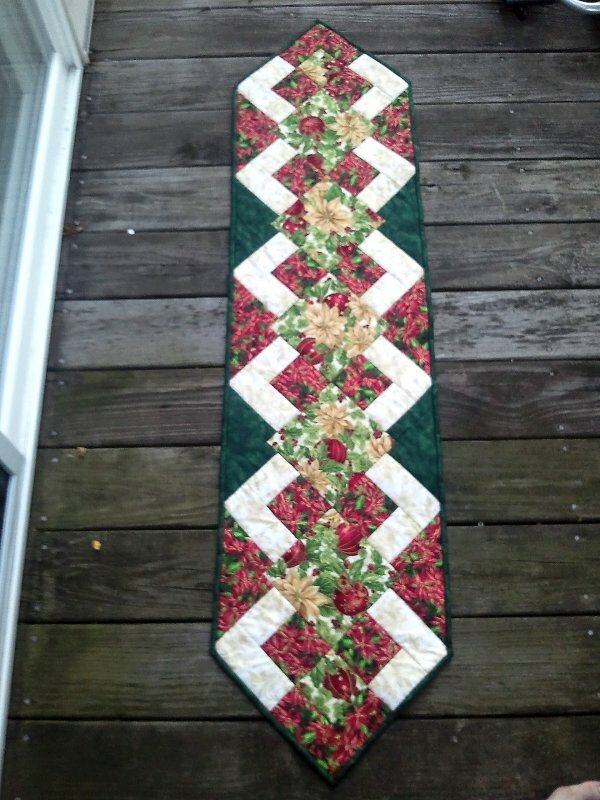 "I found a picture of this pattern on Google Images by searching for "table runners." You can find the link to the picture here. The post didn't come with a pattern, so I tried making one up. "Here's the runner that I'll be using in the tutorial when I talk about fabric colors and pieces. The colors I use are red, green, brown and white. I've re-written this to hopefully make it more user friendly. If you notice any mistakes or have questions, please feel free to email or comment. I'm not always perfect, but I am always happy to help!"